I had a very busy weekend and had strange dreams all night long. Dream brings me to the different world and it’s fun even if it was a nightmare but I was exhausted when I woke up this morning and my skin looks tired. I need to eat a quick and easy nutritious dish for my tired body and skin today. So I decided to cook my favorite healthy ingredients ‘tofu’. This is very easy & tasty tofu steak, and it’s suitable for vegetarians too. Wrap the tofu in a clean tea towel or some layer of kitchen papers, and place a heavy thing (such as a pan) on top of it to force out excess water, then leave it for about 10-15 minutes. Mix all the teriyaki sauce ingredients in a small bowl and set aside. Cut the drained tofu block into 4-6 thin blocks. Mix the flour and the corn flour, and then coat the tofu blocks. 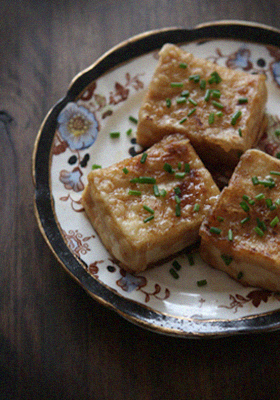 Heat the oil in a frying-pan and fry the flour-coated tofu over medium heat on each side until golden. Garnish with the finely chopped chives. You are currently reading Teriyaki Tofu Steak at Fish Trip Cafe.